Bread sauce is a weird one. Do you eat it in other countries? I think it’s a British thing – we’re pretty good at making something out of nothing. It’s basically breadcrumbs cooked in milk, with some other flavourings, and it’s usually served with a roast dinner (or Christmas dinner!). It sounds utterly bizarre, I know, but it’s one of my favourite parts of a roast. 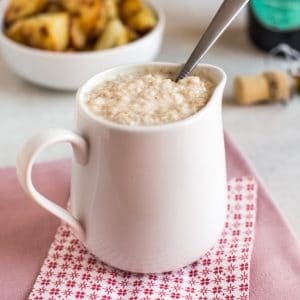 I’ll admit, I do enjoy the kind of bread sauce that comes as a powder in a packet (please don’t take away my food blogger licence), but since Christmas is quickly approaching, I thought I’d celebrate by making this easy homemade bread sauce from scratch. The end result of your homemade bread sauce will literally just be the breadcrumbs and milk (plus a bit of seasoning! ), but if those were the only ingredients you used, your sauce would be completely bland. The key is to get as much flavour into the milk as possible before you use it to make the bread sauce. Just simmer the milk with onion, garlic and a bay leaf for a while, and you’d be surprised at how much flavour you can impart! These three ingredients are all you need, but feel free to add any other extras you fancy – whole cloves, peppercorns, etc. Bread sauce: looks odd; tastes ace. Once your extra ingredients have given as much flavour as possible to the milk, just remove them and mix the breadcrumbs into the milk – and your sauce is ready. 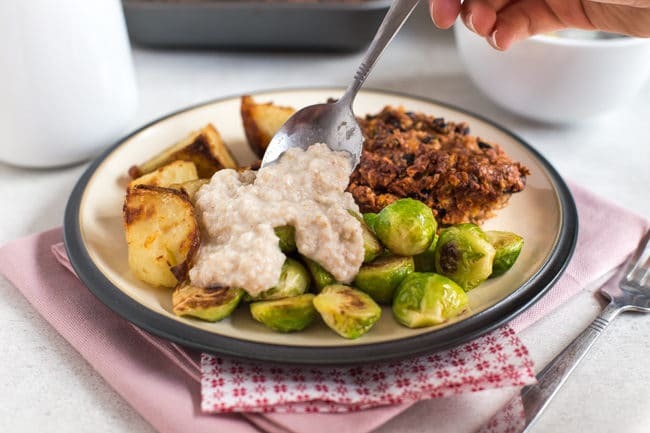 It’s fine if you want to use slightly stale bread to make your crumbs – I would imagine that’s why bread sauce was invented in the first place. It’s stuck around because it’s delicious! And perfect for livening up your Brussels sprouts. 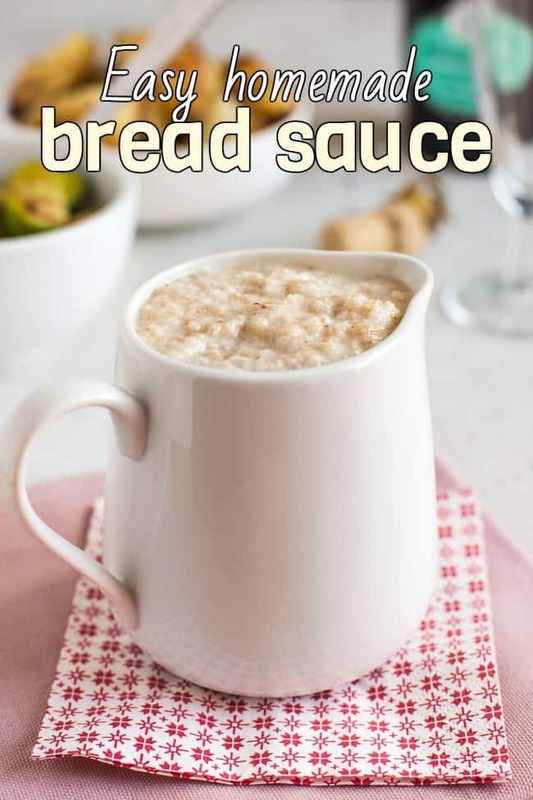 Have you ever tried bread sauce? Let me know your thoughts – I imagine it’s one of those ‘love it or hate it’ kind of things. Will my easy homemade bread sauce be making an appearance at your table this Christmas? Add the onion, garlic and bay leaf to a pan with the milk. Place over a fairly low heat, and cook gently for at least 20 minutes, stirring occasionally to prevent a skin from forming. 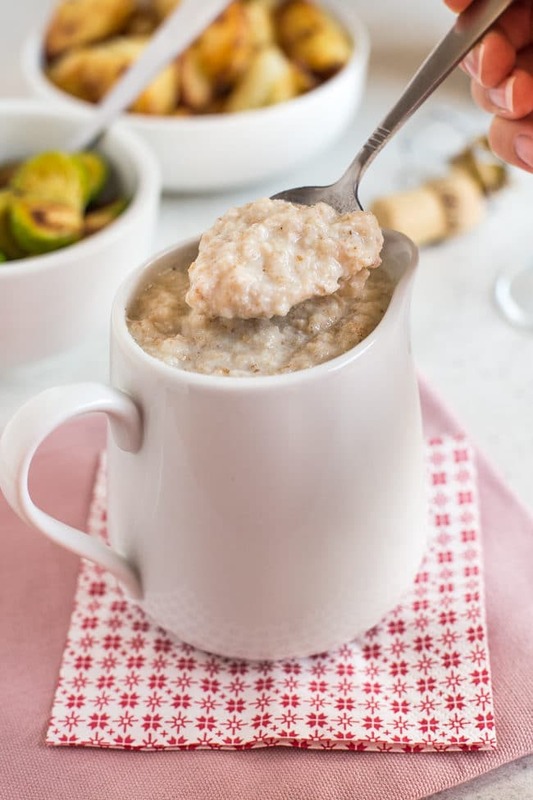 Use a sieve or a slotted spoon to remove the vegetables and bay from the milk (if using a sieve, don't forget to put a bowl underneath when you pour it out!). Return the pan to a low heat, and add the breadcrumbs and butter. Cook for a minute or two until the breadcrumbs have cooked right into the milk, and season generously with salt and pepper. Serve warm. You can make the sauce in advance and reheat in the microwave if necessary. Note: Nutritional information is approximate, and will depend on exactly what ingredients you choose. Information above is for 1/6 of the recipe. 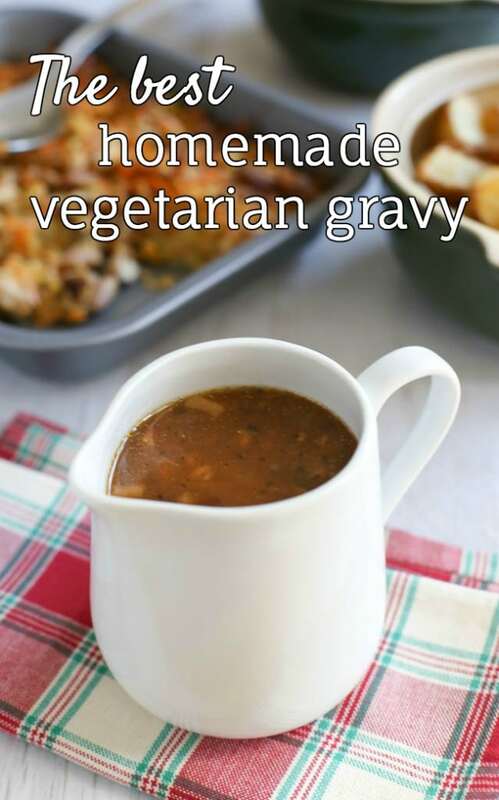 Your Christmas dinner also needs some vegetarian gravy – it goes great with bread sauce! Definitely a British thing! It looks like porridge, and I expect it’s honestly not that different (aside from the added flavours to the milk). Thanks for enlightening this American expat! I’m having a hard time wrapping my head around the idea. I guess I’ll just have to try it! Hehe yes it does sound very strange when you see it written down. It tastes good though! 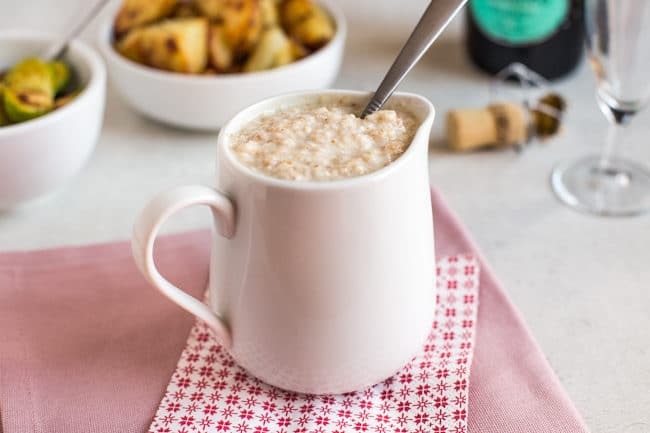 I absolutely LOVE bread sauce but I seem to be the only one in the family who is interested in it so we haven’t had it for a year or two…..I’d got lazy and used a packet mix too, though they are often a bit clove-flavoured for my taste. 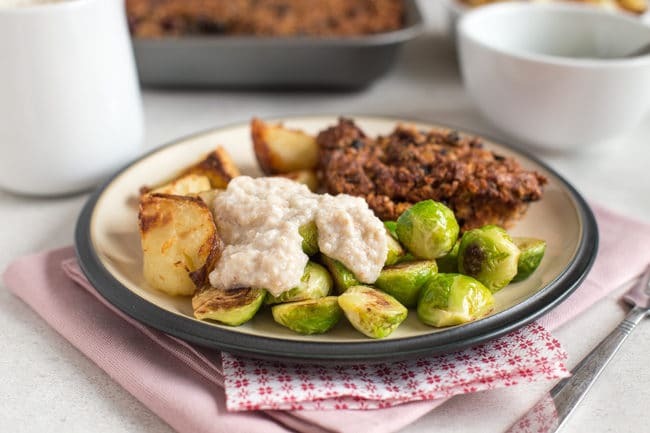 One weird thing occurred to us though – what with nut roast, stuffing and bread sauce our Christmas dinners were basically – bread!! !